Whereas the Chinese “food scene” (you can hardly call it a food scene when a city lacks quality Beijing and Shanghai cuisine) in 2009 has been dominated with the arrival of numerous restaurants and eateries opened by Mainland Chinese immigrants in Montreal’s new Chinatown, that of the traditional Chinatown on De la Gauchetière (between St-Urbain and Clark) was mostly revamped in the past two years with new Cantonese-owned shops, three of which happen to be bakeries. 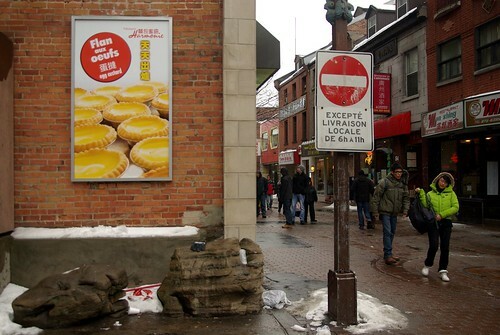 Already in the winter of 2008, Harmonie (麵包蜜語) shook Montreal’s Chinese bakery standards by opening at the corner of St-Urbain and De la Gauchetière. Buns left to die on a colourless counter were a thing of the past. Now, Chinese pastries and other bite-size delicacies or cakes would be served in a decor on par with at least what you would see in Hong Kong or other larger Chinatowns of North America: lit-up counters, uniformed staff, floral decorations. 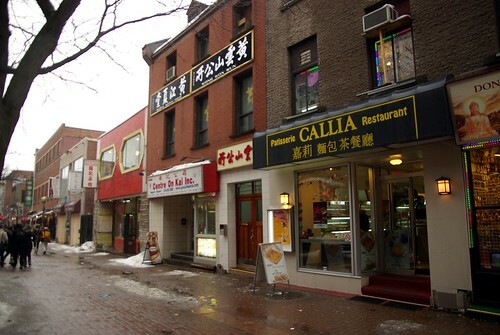 A year later in April 2009, a first competitor Restaurant Callia (嘉莉) was opened (by the family owning Chinese restaurant Keung Kee) across the street. It added the dining space and kitchen that Harmonie did not have, serving Hong Kong’s famed Cha chaan teng-style food of milk tea, beef brisket noodles and Italian noodles in Cantonese sauce, under big TV screens spouting soaps from TVB. 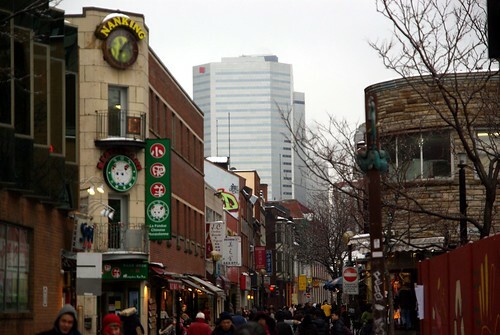 Now on my last visit of Chinatown during the Holidays, I noticed that my grandparents’ favourite (and personal longtime favourite, for lack of anything else) M.M. Légende took over the trendy “Asian-style” clothing store next door and hid behind wooden planks as it is undergoing renovations. For the past two years, I believe that it was to become the first casualty of the Callia/Harmonie combination. 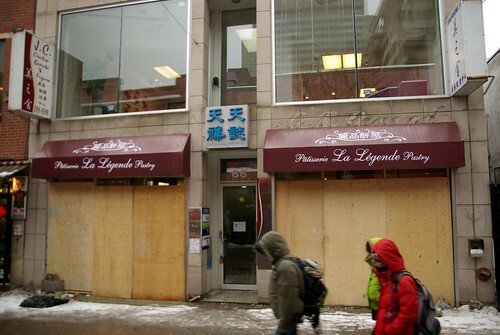 So instead, it renamed itself as Pâtisserie La Légende (麗晶餅屋) and decided to expand. Follow-ups would be greatly appreciated! Maybe now this first casualty would be Dobe & Andy (right under of Kam Fung) if they don’t change. I’m now curious to see what is going to happen with this new huge space for a cha chaan teng, in spite of more restaurant space made available with the imminent inauguration of Plaza Swatow (長盛廣場). Word has it that they want to be opened before Chinese new year. We have on going bets and the biggest spread is one month past original opening date! Callia no longer serves “cha chaan teng” meals anymore and now the dining area had turned into a storage space for floor and other non-perishable food for use in the bakery. I’m a fan of Li-Jing too I peeked one night at their renovations and it’s looking good fake ceilings and lighting, can’t wail till it re-inaugurate. I appreciate your blog entries abt our mtl. ct and the love for our chinatown. No quality Beijing cuisine? Have you been to Lao Beijing? Not been. Is it the one on Queen-Mary? I had conflicting points of view: some people adored it, while some thought it was generic. Also, what I mean by quality is also good in terms of presentation… while a fan of beau-bon-pas-cher, I also like the kind of restaurants with a nice decor, “expensive” looks, that can be found in Toronto’s Chinese suburbs for instance. There is just not enough competition right now in Montreal. We hope it changes quickly though! Lao Beijing is on Cote De Neige. Its near the metro of the same name, just a couple blocks north. My mainland friends swear by it. MM.Legendre Bakery has been reopen since January 16th~. MM Legendre will beat 麵包蜜語, 嘉莉 and Dobe & Andy so badly. – Foodwise Cha-Cheng-Teng style, Lengendre beats by far most (As a HKnese Perspective). However if you would compare the “BBQ Rice”, D&A still wins. Did you forgot to compare the most important thing, The Bread Quality. All three have similar quality but MM is in the middle in terms of pricing.